72% of patients go online to learn about their condition. And 1 in 4 turn to the internet before speaking to a doctor. Yet only 3% of healthcare advertising budget is spent on digital. And most digital DTC advertising is ineffective. A short Q&A session following the presentation. 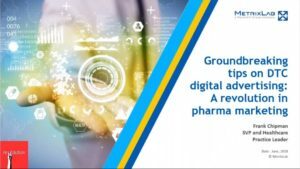 For more on this topic, you can also read MetrixLab’s whitepaper about digital advertising for pharma companies. Plus, discover some best practices for effective pharma and OTC Facebook mobile ads, as revealed in their recent study for Facebook. Click here to view the original posting of this content.